watashi to tokyo: What do you want to eat the most? What do you want to eat the most? There is no nice topic to write about today. Yes, "Hageshiku neta ga nai." So I will pick this: "The ranking of the best food which I was in animation and want to try the most"
1.Heidi's Cheese : The original is the book written in 1880 by Swiss author Johanna Spyri. You will know this this animation. You will know this animation. It aired even in Switzerland. To be honest, I have never seen it because I was addicted to Ultraman Ultraman (wiki) and Kamen rider.(wiki). The cheese in Heidi is so impressive, even my co-worker said he wants to try it. Considering that he is 42 years old, this sounds like some kind of trauma. Actually, the official Heidi site has the recipe of cheese. 2.Oishinbo menu : I don't think this animation has aired in other countries. This is a gourmet animation. The main character, Yamaoka, tries to make the ultimate menu. 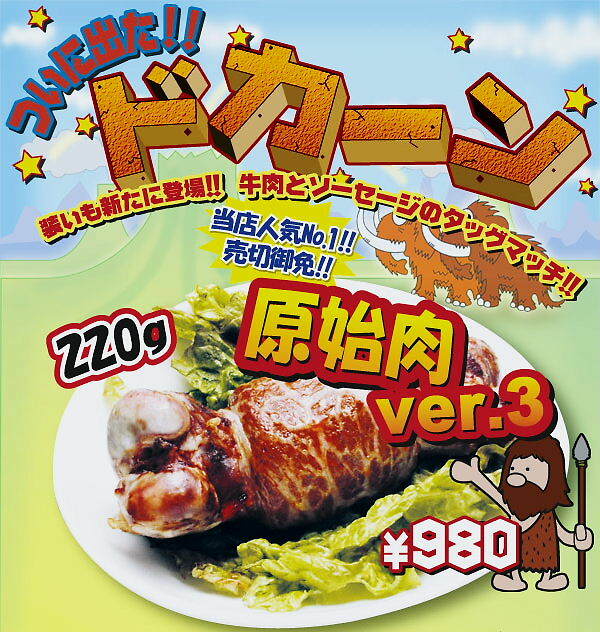 3.Meat from Hajime Ningen Gon : This hasn't aired in other countries either. I love this animation. Gon and his family always eat chunks of mammoth meat. I don't know why, but those looked very delicious. So I agree with this ranking. This restaurant serves meat on a bone as "stone age meat". And the meat is an important item of Gon's figures. You know how much we love that meat. I could find only the slow ending theme on youtube. 4.Anpanman's face : Yeah, I wrote this before. At any rate, I don't want to eat his face. 5. Senzu Bean from Dragon Ball: I don't know Dragon Ball very well. It doesn't look so delicious to me. i don't think this animation has aired in other countries. This is a gourmet animation. The main character, Yamaoka, tries to make the ultimate menu. I have never seen canned Spinach. Do you have it in the U.S so that Popye can eat it, right? Ha! That stone-age meat reminds me of the Flintstones and "bronto ribs." There was an anime that ended earlier this year, "Yakitate!! Japan," which was all about baking various kinds of bread. This wasn't my usual sort of show, but I enjoyed its silliness anyway. And of course the bread looked delicious, even if the explanations behind it were sometimes questionable (according to my wife, the Cordon Bleu chef). What about "drops" candy from Hotaru no Haka (Grave of the Fireflies)? My local Y100 shop had some Drops with a pictures of Setsuko on the tin. How this would make people want to buy it, rather than burst into tears, I'm not sure. Did you get my email? I haven't heard from you since your last email. For your information: If you don't like the idea, just say so. In america it's rude to ignore someone, and not rude to say you don't like the idea. Especially when you're asked.